Roy Sesana gave this speech when he accepted the Right Livelihood Award in Stockholm in 2005. We read this years ago and wanted to share it with you, because it's one of those rare speeches that we have wanted to read again and again over the years. It is profound and important beyond words. 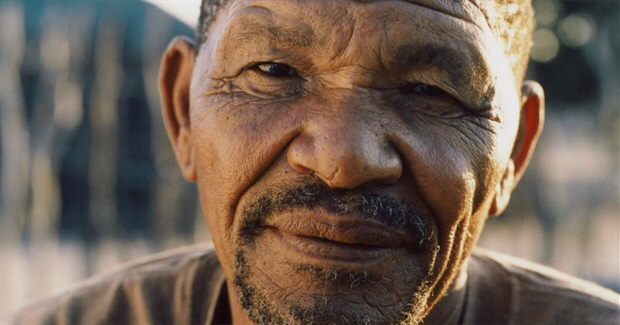 “My name is Roy Sesana; I am a Gana Bushman from the Kalahari in what is now called Botswana. In my language, my name is 'Tobee' and our land is 'T//amm'. We have been there longer than any people has been anywhere. When I was young, I went to work in a mine. I put off my skins and wore clothes. But I went home after a while. Does that make me less Bushman? I don't think so.I am a leader. When I was a boy we did not need leaders and we lived well. Now we need them because our land is being stolen and we must struggle to survive. It doesn't mean I tell people what to do, it's the other way around: they tell me what I have to do to help them. I cannot read. You wanted me to write this speech, so my friends helped, but I cannot read words – I'm sorry! But I do know how to read the land and the animals. All our children could. If they didn't, they would have all died long ago. I know many who can read words and many, like me, who can only read the land. Both are important. We are not backward or less intelligent: we live in exactly the same up-to-date year as you. I was going to say we all live under the same stars, but no, they're different, and there are many more in the Kalahari. The sun and moon are the same. I grew up a hunter. All our boys and men were hunters. Hunting is going and talking to the animals. You don't steal. You go and ask. You set a trap or go with bow or spear. It can take days. You track the antelope. He knows you are there, he knows he has to give you his strength. But he runs and you have to run. As you run, you become like him. It can last hours and exhaust you both. You talk to him and look into his eyes. And then he knows he must give you his strength so your children can live. When I first hunted, I was not allowed to eat. Pieces of the steenbok were burnt with some roots and spread on my body. This is how I learned. It's not the same way you learn, but it works well. The farmer says he is more advanced than the backward hunter, but I don't believe him. His herds give no more food than ours. The antelope are not our slaves, they do not wear bells on their necks and they can run faster than the lazy cow or the herder. We run through life together. When I wear the antelope horns, it helps me talk to my ancestors and they help me. The ancestors are so important: we would not be alive without them. Everyone knows this in their heart, but some have forgotten. Would any of us be here without our ancestors? I don't think so. I was trained as a healer. You have to read the plants and the sand. You have to dig the roots and become fit. You put some of the root back for tomorrow, so one day your grandchildren can find it and eat. You learn what the land tells you. When the old die, we bury them and they become ancestors. When there is sickness, we dance and we talk to them; they speak through my blood. I touch the sick person and can find the illness and heal it. Why am I here? Because my people love their land, and without it we are dying. Many years ago, the president of Botswana said we could live on our ancestral land forever. We never needed anyone to tell us that. Of course we can live where God created us! But the next president said we must move and began forcing us away. They said we had to go because of diamonds. Then they said we were killing too many animals: but that's not true. They say many things which aren't true. They said we had to move so the government could develop us. The president says unless we change we will perish like the dodo. I didn't know what a dodo was. But I found out: it was a bird which was wiped out by settlers. The president was right. They are killing us by forcing us off our land. We have been tortured and shot at. They arrested me and beat me. Thank you for the Right Livelihood Award. It is global recognition of our struggle and will raise our voice throughout the world. When I heard I had won I had just been let out of prison. They say I am a criminal, as I stand here today. I say what kind of development is it when the people live shorter lives than before? They catch HIV/AIDS. Our children are beaten in school and won't go there. Some become prostitutes. They are not allowed to hunt. They fight because they are bored and get drunk. They are starting to commit suicide. We never saw that before. It hurts to say this. Is this 'development'? We are not primitive. We live differently to you, but we do not live exactly like our grandparents did, nor do you. Were your ancestors 'primitive'? I don't think so. We respect our ancestors. We love our children. This is the same for all people. We now have to stop the government stealing our land: without it we will die. If anyone has read a lot of books and thinks I am primitive because I have not read even one, then he should throw away those books and get one which says we are all brothers and sisters under God and we too have a right to live.